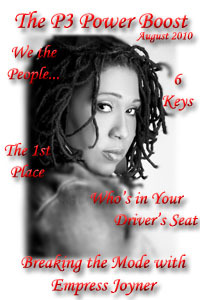 Speaking like a woman destined to blaze the crowd, I had the priviledge of being in the presence of Empress Joyner. Talk about passion blazing, she is a fire waiting to ignite at any moment to spread the vision of purpose with all others. Empress was born in South Carolina. She recognized at an early age that she was not one to conform to most things. She was quite the outspoken young lady and had her eyes set on her own goals. She moved to the DC area and begin her career without looking back. Empress shares her journey with us; often dropping nuggets of inspiration for all who listens. What I was most inspired by during my talk with Empress was her natural gift to provide a healing bond for others. She experienced moments of healing throughout her own life and saw that process as a gift to give to the world. Empress uses her healing as a means to provoke healing thought to others through her plays and prose. She’s fascinating, delightful, and powerful all in her words. One cannot help but find themselves in her every journey. Sometimes conforming can limit your abilities to achieve your higher destined purpose. But Empress broke the mode and did things her way. Sit back and enjoy this moment with Empress Joyner. She shares her two favorite quotes and the best advice for women going after a dream. She sings, she writes, she empowers and she dances to her own tune – she who breaks the mode! Enjoy!